Peritoneal mesothelioma survivor F.X. Dickert doesn’t have time to die. His schedule is already full. Dickert, 66, will undergo aggressive surgery in October for the third time in the last two years, and he’s approaching it with the same energy and optimism he had for the previous two operations. Dickert, who lives near Madison, Wisconsin, will soon undergo another cytoreduction and a second round of hyperthermic intraperitoneal chemotherapy (HIPEC), expecting to stop the latest tumor growth and lead to another quick recovery. Then the fun will resume. Somewhere along the way, Dickert will enroll in an immunotherapy clinical trial with mesothelioma specialist Dr. Hedy Kindler at the University of Chicago Medical Center — schedule permitting, of course. There is also a safari in South Africa on his to-do list and another fly-in canoe trip to northwest Ontario, where in past years he has come face to face with black bears, caribou, moose and golden eagles. He forgot to mention the road trip he already scheduled with three other couples for the Nebraska-Wisconsin college football game Oct. 7 in Lincoln, Nebraska or the fishing trip on the Salmon River in Ontario with two of his sons. Yes, he plans to stay busy. Dickert is fortunate to have the financial resources that allow him to still enjoy the adventurous lifestyle he loves. He rarely sits still. His pace may have slowed, but his desire has not. He and Merar-McCloud credit his survival to mental toughness. This summer was exhausting as he recovered from an intense radiation regimen and internal hemorrhaging, which prevented him from enrolling in the clinical trial. Yet he continues to persevere. Dickert still owns and helps manage a successful industrial paint contracting business that has been in the family for three generations. It employs more than 450 people. Dickert was diagnosed in July 2015 when he returned from a trip to Canada, first thinking it was only a painful hernia from carrying his canoe for too many hours. He had been taking trips to the Canadian outdoors his entire adult life. This summer was the first time in 40 years he didn’t make it. After considerable testing, doctors eventually diagnosed him with peritoneal mesothelioma, which was spreading throughout his abdominal cavity. He believes it was caused by asbestos exposure on a job site in the mid-1970s. 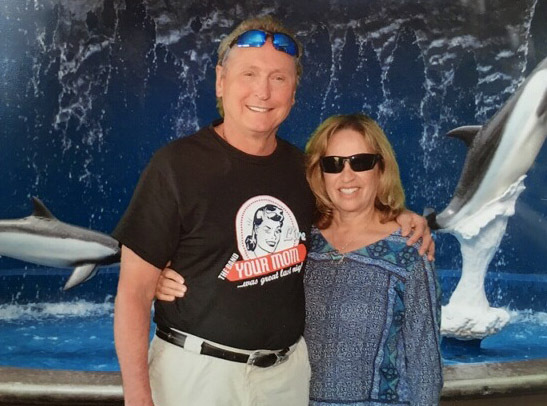 With wonderful support from friends and family, and the money to do it, Dickert traveled to find mesothelioma specialists around the country, getting second, third and fourth opinions. He wanted to know everything. He settled on Dr. Kiran Turaga, a peritoneal specialist, for the first two surgeries. Turaga works with Kindler, whose own father died of mesothelioma. The first and second surgeries did not stop him. He and Merar-McCloud traveled extensively in 2016 after his speedy recovery, visiting Hawaii, Australia, New Zealand and New Mexico. Sitting still has never been an option. When he sells his home near Madison, he will be moving his base to central Wisconsin, where he already keeps a 300-acre ranch bordered by two lakes and filled with wildlife. There is considerable work to do there.